The School of Communication relies on private support to fulfill our mission of providing quality graduate and undergraduate communication in the field of human communication. Click the “Give Now” link below to make a gift to the School of Communication or choose from one of our programs below. Aztec Forensics: Aztec Forensics is SDSU’s intercollegiate speech and debate team – it represents a tradition of over 50 years of excellence. Contributions to this program support squad development, including travel, recruitment and scholarships. 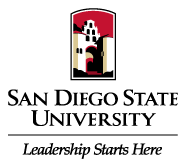 The Paul J. Gaske Memorial Scholarship: This scholarship has been established to honor SDSU graduate, faculty member, debate coach, and loyal friend of the Aztecs, Dr. Paul Gaske. The scholarship supports an active member of the debate team. School of Communication Director's Drive for Excellence Fund: Provides funds to enhance the student experience, attract and maintain expert faculty, support graduate student excellence, fund innovative research and provide overall enrichment for the School. William Snavely Endowed Study Abroad Scholarship: Dr. William Snavely was a Professor of Communication and Director of the School of Communication from 2007-2017. The goal of the program is to enhance students' global understanding. The scholarship was established to help students who are financially challenged reach their ability to travel and study abroad. Center for Communication, Health, & the Public Good: is an innovative hub for investigating critical relationships between communication and health that shape the human social condition in contemporary society. Center for Media and Performance: is an interdisciplinary forum for critical inquiry into the many expressions of live art and screen culture. Major Gifts: If you are interested in making a major gift to the School of Communication, please contact the Dean’s Office directly. See contact information below. A major gift may include naming opportunities.